Although it sounds like the Heartless Bastards had a pretty hectic day yesterday and were late to arrive into Kansas City from Minneapolis, they put on one hell of a show. Starting the night off was The Sixteens, an all girl band from Kansas City who screamed their way through their set. Call me old fashioned, but I just don't dig that. Their gritty punk(ish) music was kinda fun at times, but overall I was waiting for them to finish. Next up was The Only Children, from Lawrence, KS, who blend rock/rockabilly/folk into one fun marvelous sound. I liked lead singer Josh Berwanger's voice and when his bandmates sing along, they harmonize nicely. Band member Heidi-Lynne Gluck also has a great voice that she highlighted in their song Amen Amen. There were quite a few songs I liked, and today I regret not picking up their new cd, Keeper of Youth...all in good time. 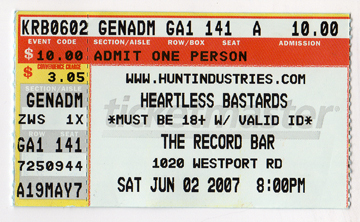 Finally, the Heartless Bastards were up and despite their hectic day, they were great. Lead singer Erika Wennerstrom is an amazing talent; her lyrics, honest and raw. Despite the fact that she's probably no taller than me (5'3"), she can really belt it. Her voice gives such force and presence that you can't help but take notice and listen. Bassist Mike Lamping and drummer Kevin Vaughn are equally talented and are spot on. Together, they put on an amazing, fun, inspiring show with a lot of heart.